How can your local Main Street program better use limited resources to create vibrant, people-centered places? The Main Street Approach has been a successful model for older commercial district revitalization for more than 35 years and is used to revitalize and manage downtowns in more than 2,000 communities across the U.S. The Four Point approach offers a simple guide to comprehensively address a complex and sometimes chaotic downtown environment. While that is true, it is a challenge to get the equation just right to catalyze reinvestment, create jobs and create a better quality of life, and especially to do it just right. 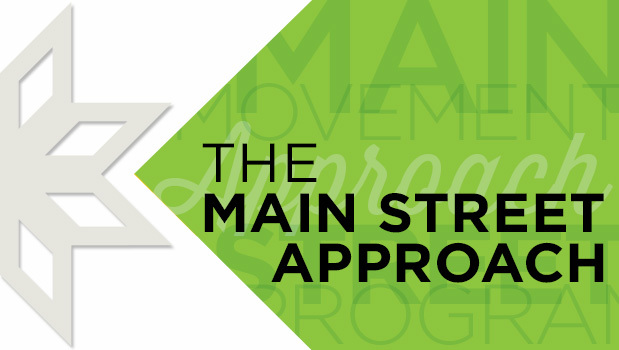 Throughout the past few years, the National Main Street Center has conducted surveys, convened a task force of experts and engaged closely with the Main Street network to develop a revised framework. This revision, called the Four Point Refresh, is the same approach, just sharpened, made more strategic and with a focus on visible results. Identify the Community Vision for Success – This essential step provides a foundation for outlining the community’s own identity, expectations and ideals, while building off of market opportunities. Create Community Transformation Strategies – Work together to identify strategies that provide a clear sense of priorities and direction. These strategies align with the four key areas: economic vitality, effective promotion, quality design and a sustainable organization. Typically communities will find two to three strategies to help reach a community vision. Implement and Measure – To succeed, the effort must be able to demonstrate the wise use of resources, which translates to real change on the ground: new jobs added to Main Street, new businesses open, buildings redeveloped and certainly other metrics of success. Find out more about how to make your local revitalization efforts better, stronger and faster by coming to the next Virginia Main Street training. VMS offers trainings throughout the year, and there is sure to be one near you.